What makes the difference between an ordinary professional and an extraordinary one? A mastery of business manners. That’s why Ann Marie Sabath’s pocket-sized guide to business etiquette emergencies is indispensable for new hires and college graduates just starting out, as well as a valuable tool for career veterans looking to add finesse to their workplace repertoire. 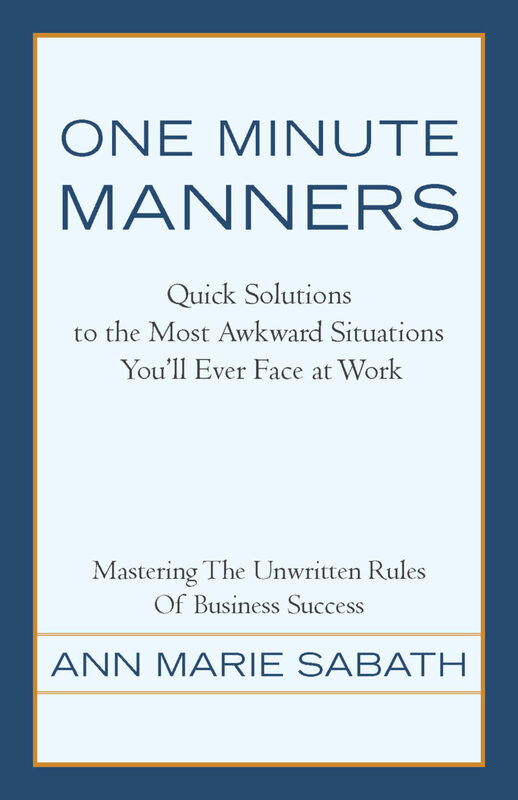 Unlike encyclopedic etiquette books that run over with irrelevant advice, One Minute Manners is the source for quick solutions to the most awkward situations any professional will ever face at work—as taught by Sabath during her 31 years of domestic and international etiquette consulting for Fortune 500 companies. A bore has latched on to you at a company event. How do you tactfully break away? You’ve mistakenly forwarded a confidential message to the wrong person. Now what? You show up for a client meeting only to realize that you’re dressed too casually. What do you do? You want to introduce a client; however, his name has escaped you. What do you do to get the person to say his name? Covering everything from how to deal with the fallout from a hasty e-mail to discreetly letting a server know you are picking up the bill for everyone at the table, One Minute Manners minimizes business awkwardness and maximizes your chances for professional success. Not being able to attach a name to the face of the person approaching you. Simply extend your hand and say your first and last name. Better chance than not the person will mimic you—with his name, that is. However, if you definitely know the person and his name still escapes you, simply speak in general terms without using names. For example, you might say, “What’s been going on since we last spoke?” General questions may trigger an answer that will bring the person’s name to mind. Actions and getting to the point speak louder than a lot of jibber–jabber. Rather than being labeled as a person who gives TMI—too much information (e.g., “I’m sorry, I’m so bad with names. I’ve forgotten your name. How do we know each other?”)—let your handshake and name be the cues that prompt the other person to greet you using his name. Wondering if you should say, “It’s nice to meet you” or “It’s nice to see you” when an individual greets you, making you feel as though he is a long lost friend. When you find yourself in this awkward situation, say, “It’s nice to see you.” Even though this person may be unfamiliar to you, this greeting will be perceived as warmer than “It’s nice to meet you.” “It’s nice to meet you” also implies that this is the first time you are meeting this person. Oftentimes individuals may recognize you without you necessarily knowing them, especially if you are in a highly visible position. When you find yourself in this situation, remember it’s not about you, it’s about making the other person feel comfortable.